From January to May 2018, an online survey was widely circulated to humanitarian organisations and networks to explore how meanings and uses of concepts central to the humanitarian field are perceived by practitioners. 1435 respondents connected to survey, 1060 finished it and 766 respondents answered all questions entirely. Respondents were asked to think about a concrete example when they and a colleague from another organization or from their own organization disagreed on the meaning of a specific term. A list of reasons to explain this disagreement was provided. 35 % of the respondents indicate that the disagreement is due to the diverging interests of their organization/department whereas 25% explain it by different professional training. We then asked respondents to indicate the definition of a concept which reflects the one they use in their daily work. We chose two commonly used concepts – humanity and crisis – and reviewed existing literature, glossaries and websites to identify divergent definitions. Two results stand out for the concept of “Humanity”. First, nearly all the respondents selected one of the proposed definitions, meaning that the list proposed covered the diversity of meanings of the terms. The most selected definition is the one proposed by Wikipedia – this result is consistent with the fact that most respondents quote Google and Wikipedia when asked to provide the name of an online resource they use to clarify the meaning of some terms. The second most frequently selected definition is the one of Relief Web which is also largely referred to in the humanitarian field. The definition of the Red Cross/ Red Crescent movement comes third. We then repeated the same analysis with the definition of the concept “Crisis”. As before, the definitions proposed reflect respondents’ uses as only 1.3 % of respondents stated that none of the definitions fit their use of the concept. In contrast to humanity, respondents overwhelmingly selected one definition (the first one). This may be explained by the fact that “humanity” as a concept having a close relationship to personal, organisational and societal value is used in a larger variety of ways than a technical and factual concept like “crisis”. An initial statistical analysis of the factors leading respondents to opt for a specific definition yields an interesting result: the definition of the OECD is more frequently selected by respondents with a background in economics and by respondents working for governmental entities. This confirms the role played by the OECD as a forum of policy dialogue and definition between governmental aid agencies. 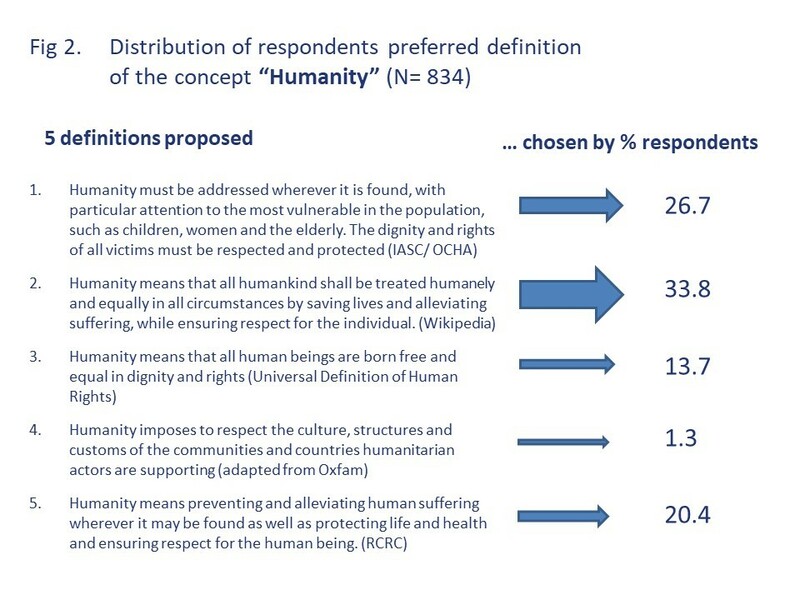 These results confirm that definitions of terms and concepts in the humanitarian sector are not consensual. Further analyses showed that organizational factors are predominant in explaining differences. In particular, a strong cohesion of the RCRC Movement in using definitions of key terms was evidenced. The region of work and discipline also seem to matter. Operationalising humanitarian concepts: can we agree to disagree? Our hypothesis was that practices vary more than the definition of concepts. To assess the extent to which the operationalisation of concepts by humanitarian organisations vary, we selected two concepts likely to be familiar for a diversity of humanitarian actors and for which reports were available to map the diversity of practices: “protection” and “capacity-building”. Respondents could select up to two answers per question. The goal was not to be exhaustive but to assess the reaction of respondents when provided with a list of pre-identified practices. Regarding protection, the results partly support our hypothesis (Table 1). The third proposed practice “Alleviating victims’ immediate suffering through the provision of emergency material, medical assistance and psychosocial care in affected areas” is predominantly selected. This preference is even more striking when we consider the fact that a large number of options were proposed. Yet, when we look at the distribution of votes for the other practices, results show that the votes of respondents are relatively evenly distributed among the proposed practices. No proposed item received less than 10% of answers. Although one item stands out, this confirms that practices associated with a concept are very diverse. This result is confirmed when we look at respondents’ opinions on the practices associated with capacity-building. No proposed item is predominant. Two practices “Providing international and local humanitarian staff with adequate training” and “Developing learning resources, best practices and standardization of common tools and processes” are each chosen by approximately 40% of respondents. The third most selected item is “Helping affected states to develop institutional mechanisms for crisis response and preparedness” (35%). These initial results confirm that beyond diverse definitions of concepts, their operationalisation is perceived differently. It also shows that practices vary more than the definition of the concepts. We will further examine how this relates to the organisational and disciplinary background of respondents and assess the importance of other factors (funding sources, collaboration history) in shaping uses of concepts. For protection, practices were identified through the reports of the Global Protection cluster, the GPPI scoping study on protection, as well as the HPG review of field-based practices in Darfur. For capacity-building, we mainly relied on the resources provided by the Emergency Capacity Building Project. For more on how concepts central to humanitarian practice have evolved since 1968 and the birth of sans-frontiérisme, please watch the video here. ← Do we all speak and practice “humanitarian” in the same way?